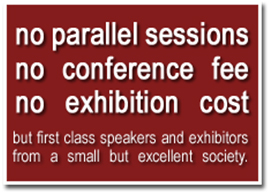 Symposium and Exhibition will be free of charge for delegates and exhibitors. The exact price for overnight stay in the conference hotels (4-star) will be announced here in due time. For lunch (including vegetarian), coffee and soft-drinks during the conference we will request a contribution of EUR 25,00 per person and in total for the two conference days. For the conference dinner on Monday, we will request another contribution of EUR 25,00 per person all to be paid at the registration desk or with the advance online registration. Exhibitory organizations are requested to contribute EUR 25,00 for the table top expo which includes electricity and helping hands. OZ-16 exhibition is therefore practically free of charge (EUR 25,00). A full-page colored advertizing in the conference guide goes at EURO 25,00 for participating companies and institutions at limited number.